How the bicep tenses is no longer a secret. In every muscle cell there are so-called myofibrils, which contract at the same time. They are responsible for muscle movement. Each of these fibrils represents an exact pattern of hundreds of identical units consisting of different protein molecules. However, it is not yet understood how these individual building blocks arrange themselves into highly regular patterns during embryonic development or healing processes. An interdisciplinary team involving the physicist Dr. Benjamin Friedrich (Center for Advancing Electronics Dresden – cfaed, TU Dresden) has now acquired a research contract from the "Human Frontier Science Program" to investigate this question. However, how the individual building blocks of myofibrils arrange themselves into such highly regular patterns during embryonic development or during healing processes (e.g. after sports injuries) is still a matter of controversy in science. In order to uncover this secret, cooperation between different scientific disciplines is required. An interdisciplinary team led by biologist Frank Schnorrer (Developmental Biology Institute of Marseille – IBDM), the physician Olivier Pourquie (Harvard Medical School) and the physicist Benjamin Friedrich (Center for Advancing Electronics Dresden – cfaed, TU Dresden) has now been awarded a research grant by the international "Human Frontier Science Program" to investigate this question. The grant has a volume of over one million US dollars and a term of three years. Frank Schnorrer's group will use high-resolution video microscopy to follow the individual stages of pattern formation in the fruit fly model organism. The flies are genetically modified so that individual molecules can be made visible or turned off. The researchers also hope to use novel biomolecules that light up when they are subjected to mechanical stress and thus enable the precise measurement of minute forces. For the first time, it is now possible to investigate how the formation of regular structures and the generation of mechanical forces go hand in hand during the self-assembly of myofibrils. 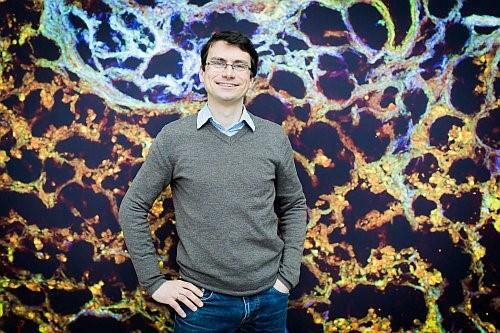 Oliver Pourquie's team uses human stem cells that are differentiated into muscle cells in the Petri dish. This enables to test the findings obtained from fruit flies directly on mammalian cells without the need for animal experiments. The Dresden-based project partner Benjamin Friedrich is research group leader in the "Cluster of Excellence" cfaed at TU Dresden. Among other things, he investigates the question of how biomolecules spontaneously assemble into functional structures and how these processes function robustly even in the event of disturbances and fluctuations. Of particular interest is the transfer of biological principles to engineering problems, such as the self-organised dynamics of stochastic components. Conversely, dealing with technical applications gives a completely new view of the fundamental biological question of how biological systems function reliably, despite various interferences. Here, Dresden is an ideal location for interdisciplinary research with the University of Excellence TU Dresden with the Cluster of Excellence cfaed, but also the proposed Cluster of Excellence "Physics of Life", and the many partner institutes, such as the Max Planck Institute for Molecular Cell Biology and Genetics, or the Biotechnology Centre. cfaed is a "Cluster of Excellence" within the Excellence Initiative of the German federal and state governments. The interdisciplinary research center for advancing electronics is based as a Central Academic Unit at TU Dresden, and also integrates TU Chemnitz as well as nine non-university research institutions in Saxony as participating institutions. The Cluster brings together 300 scientists from around 30 nations. It is engaged in the development of completely new solutions for the transmission and processing of information. With its vision, the Cluster aims to shape the future of electronics and initiate revolutionary new applications, such as electronics featuring zero-boot time that are capable of THz imaging, or support complex biosensors. In order to achieve its goals, cfaed combines the thirst for knowledge of the natural sciences with the innovative power of the engineering sciences. Novel materials such as 2D materials, silicon nanowires, carbon nanotubes or polymers as well as completely new concepts such as self-assembling structures from DNA originals are investigated. The DFG-funded Cluster is in its first funding period, which runs from 2012 to 2018. A proposal for a further seven-years funding period has been submitted.